What better way is there to learn a programming language than with a game-oriented approach? If you ask the many readers that have made this book's prequel, PYTHON PROGRAMMING FOR THE ABSOLUTE BEGINNER, a bestseller, they'll tell you - there isn't one. 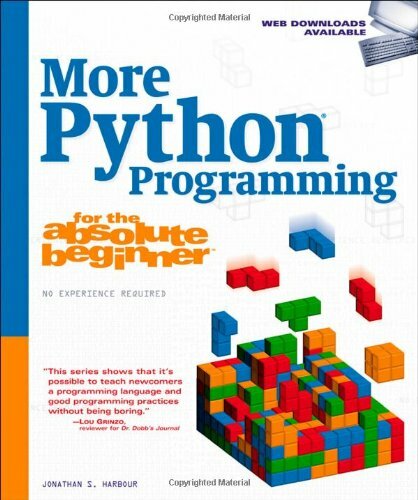 MORE PYTHON PROGRAMMING FOR THE ABSOLUTE BEGINNER offers readers more practice, more exercises, and slightly more advanced instruction in Python programming, all while using the game-focused examples and projects that have proven to be both effective and fun. It picks up where its prequel leaves off, addressing data structures, file handling, exceptions, object oriented programming, GUI programming, multimedia programming, name spaces, and program planning. Following a deliberate, logical progression of topics that cover increasingly complex subject matter, this is a powerful resource that will arm readers with an in-depth knowledge of the Python language.